Pitfall Harry for Super Smash Bros.
With the surprise announcement of Cloud Strife in Super Smash Bros. for 3DS & Wii U, as well as the upcoming mysterious December Smash Bros. special report, I felt inspired to start up a new line of Smash character what-ifs. You can see the previous ones I’ve made below. Pitfall is significant in that, to my knowledge, it’s the first horizontal multi-screen platform game, and in terms of its implementation on the Atari it is a technical marvel, like creating boeuf bourguignon out of leather shoes and ketchup. Because of this, I think Pitfall Harry could reasonably have a place in a pantheon of gaming icons, however unlikely. However, the first challenge that presented itself is the fact that Pitfall Harry has no consistent design. In addition to the fact that his original sprite (although amazing for its time) has no real identifiable features, Pitfall Harry across adaptations and sequels changes size, hair, clothes, musculature, personality, and more from one iteration to the next. As mentioned on the image itself, I decided to prioritize Pitfall Harry’s movements, because they’re what’s iconic about him, while trying to keep his silhouette closer to the original sprite wherever possible. If he can for the most part capture the animations of the Atari 2600 sprite in Smash, then his identity should come through. This should also be reflected in the audio. When he jumps, he should make that distinct Atari noise (or a higher-quality version of it), and when he does his Jungle Swing Pitfall Harry should yell out like Tarzan. As for the attacks themselves, I feel that Pitfall and Pitfall II are where most of the game franchise’s influence comes from, and so they should be prioritized. His Final Smash is his “deadliest enemy, the crocodiles,” his Balloon recovery move comes straight out of Pitfall II (and is super vulnerable so only useful as a last resort), his Tar Pit trap references both the treasure and hazard aspects of Pitfall, and the Jungle Swing is iconic. The main exception is the Slingshot neutral special, taken from Pitfall: The Mayan Adventure and other sequels. If his son can use it, I’m sure Harry can as well. Gameplay-wise, I picture Pitfall Harry as being average in weight, average in ground speed, a little above average in air speed, and below average in racking damage and KO power. He’s not that much of a fighter (unlike Mario, jumping on enemies just kills Harry), so he would function primarily as a zoning and trapping character who controls space with his specials, but doesn’t have as much sheer recovery power as Smash 4 Villager. If anything, he’d be closer to Duck Hunt. However, his trapping game is not to be underestimated. Tar Pit works like a souped-up version of a burying attack, both getting the opponent stuck and dealing damage over time. It would also be unblockable, which somewhat makes up for his tether grab. The caveat is that it is very obvious where it is located, with the big glowing gold bar to indicate the trap, but this also means that the opponent best steer clear of the location. 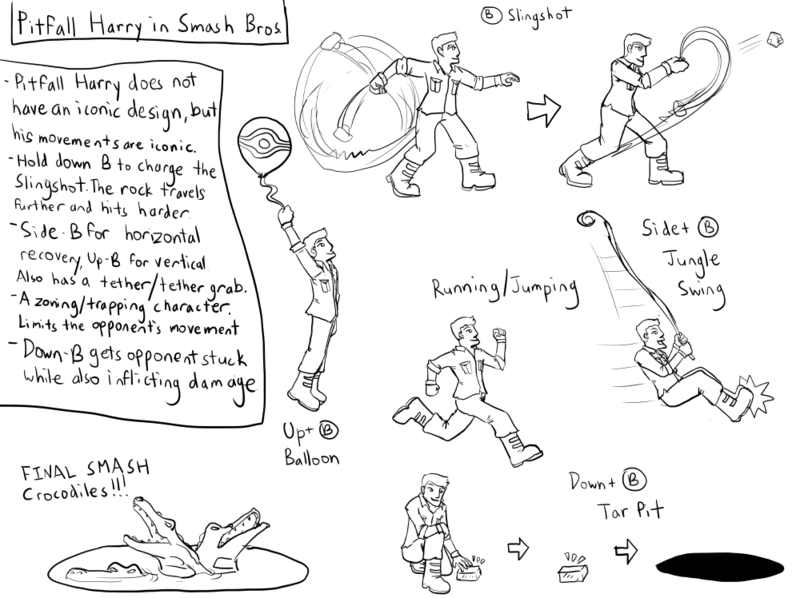 Essentially, Harry could cut off a portion of the stage, such as Smashville’s platform or Battlefield’s top platform, and manipulate the opponent to get hit by a Jungle Swing or a smash attack (which would mostly involve fists). Overall, Harry would emphasize cunning and ingenuity. To succeed as Pitfall Harry requires a clear understanding of space control, as well as adapting to a somewhat unorthodox neutral game. This entry was posted in smash bros, video games and tagged pitfall, pitfall harry, smash bros 4. Bookmark the permalink.